I used to watch children happily walk to the burn treatment room, then hear them scream. The next day they'd happily walk down the hospital hall again, and again, the screams. Versed (midazolam) makes you forget. A child may exhibit all kinds of signs of pain, but he will not remember it. It's as though it never happened. Does pain without a history still count? To investigate whether decapods feel pain we gave hermit crabs, Pagurus bernhardus, small electric shocks within their shells. Only crabs given shocks evacuated their shells indicating the aversive nature of the stimulus, but fewer crabs evacuated from a preferred species of shell indicating a motivational trade-off....Most crabs, however, did not evacuate at the stimulus level we used, but when these were subsequently offered a new shell, shocked crabs were more likely to approach and enter the new shell.....Thus the experience of the shock altered future behaviour in a manner consistent with a marked shift in motivation to get a new shell to replace the one occupied. The results are consistent with the idea of pain in these animals. Thus the experience of the shock altered future behaviour in a manner consistent with a marked shift in motivation to get a new shell to replace the one occupied. Translation: they want to get the hell out of Dodge. Hermit crabs did not develop a memory of pain because of this study; they have always had it. While we wrestle with whether crabs feel "real" pain or not, people continue to rip off their claws, and crabs continue to feel whatever it is they feel when an appendage is torn off. I don't need science to convince me their responses is "consistent" with pain. We live in a culture that created the 20th century. Napalm. Pesticides in breast milk. Thermonuclear weapons. Imagining pain in others creates too much pain is us. We lie to our children because we lie to ourselves. So hermit crabs apparently remember pain. I'm not surprised. Humans are wonderful creatures. We are part of a greater web of life, ultimately incomprehensible. Animals cavort throughout the Earth, energy obtained through plants or other animals, ultimately obtained from sunlight. This morning I helped a stranger wrestle a 30 pound striped bass out of the Delaware Bay. I felt her muscles twitch as I rolled her up on the beach. I saw her eye gaze at me once we finally beached her. The family sitting down to feast on that striper tonight know it cost a life. I went and got a half dozen clams, and slaughtered them in my attempt to beach a striped bass. They cost me $4.82. It cost them their lives. Death is common and death is inevitable. Ecstasy is also common, but we work hard to avoid it. My year is winding down. I am wrestling with grades and finals, putting some stamp of accountability on my students. This one's a 92, this one a 58. This one passes, this one's going to honors, this one fails. I teach biology and physical science. I follow the curriculum. My children are a little book smarter in June than in September. My kids will do fine on any standardized test measured against other kids facing the same struggles day to day. That's my job, and I work hard to accomplish that. My own criteria for success do not mirror the state's, but they do not conflict with it either. If you want to teach science well, you're going to break a few myths. For physical science, I want the children to grasp that they do not grasp gravity, that there's a mysterious force throughout the universe pulling everything together, against another primal force that apparently sent everything flying apart. You know when they get it. They look like the floor just dissolved. For biology, I want the children to grasp the essence of life, as far as we know it. Life is a crazy quilt of organisms glomming energy from the sun, all living things on Earth descended from other living things, and the environment shapes who we are. Humans were not inevitable. We are all going to die. Which brings me back to the hermit crabs. They have no more understanding of this beingness than we do, but (and this is not something I teach, as it crosses the boundaries set by the curriculum), they have no less, either. The human difference is, I think, that we have access to midazolam, to words, to culture, to creating universes that only exist in our minds. We can escape thoughts of our own death, of the deaths of everyone we love. Hermit crabs, of course, cannot. 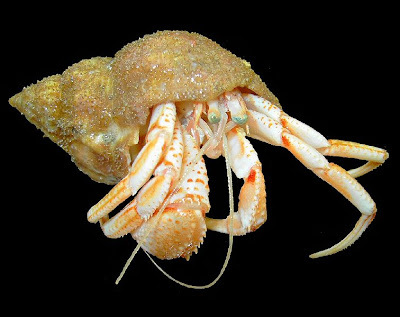 The hermit crab who has been zapped with electricity in his shell wants or desires or needs (or whatever anthropomorphological word you choose to use) to find a new home. It is not blessed with self-awareness, but it knows what it wants. It's not so much that humans are less special. We are, indeed, special. But so are the hermit crabs and the slugs and the gannets and everything else that uses energy to create order, to exist. I'll let the priests and the shamans and the rabbis and the bhikkhus figure out the metaphysical stuff--I'm plenty occupied with the natural. It's an awesome world here. Photo by Hans Hillewaert, found at wikimedia here. This reminds me of the Jonas I found half-buried on the California coast some months ago. It struggled to stay in the sand, even as I pulled at it, and as I held it it searched for my fingers with its claws. Evolution hasn't done a thorough job yet of splitting us apart - still a core with limbs radiating out, still eyes and mouth at the front. Our brains are wired to recognize other humans, but other critters, not so different, really. I'm still waiting (17+ years now) for someone to explain the difference between say, a 91 and a 92 to me. No reason to expect evolution to splitting us apart, so long as the Jonas crab thrives in its environment, and we in ours. I suspect the Jonas crab will be here long after we go, but I'm OK with that. We're all part of this bigger thing. The Jonas crab has been evolving as long as you and I, no more, no less. Everything alive on Earth has been busy glomming energy from the sun and each other since whatever happened happened a few billion years ago. You know this already, but most of us don't. If we did, we wouldn't be living the way we do. I was just thinking about this as I was entering in final grades today. We grade students by letters, converting them from numbers. For the final grade, we need to re-translate the letter grades back into their original number grades, come up with an average, then use that number to determine a letter. I hate grades, too. I'd rather shoot for competency. I agree with both of you about competency. Grading is so hard.